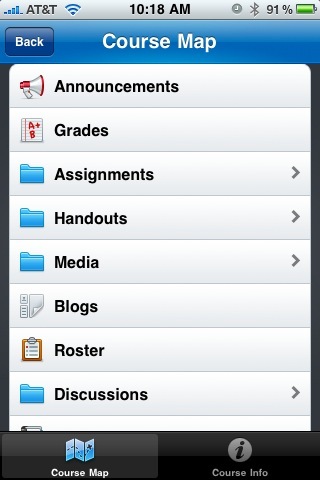 I attended a webinar today on Blackboard Mobile Learning. It was interesting and exciting to see how it's become more refined. Students today have access to a variety of electronic mobile devices. One of my favorites is the iPad demonstration. It's a neat way of displaying course and delivery with seamless movement from course to course. Bb also mentioned keeping the student user in mind while trying to develop these apps. I downloaded the Bb app for mobile learning and viewed some of the demos. The screen shot is the "landing page". I see using this with the parents in A`o Makua. They say they don't have time, but the content in the course can be something they access while waiting for things such as in line at the supermarket, Dr.'s appt., kid's games, ect... Maybe this will entice them to access the course.